Real Estate Appraiser August 2016 Board Exam Results (List of Passers, Performance of Schools) - Balita Boss! 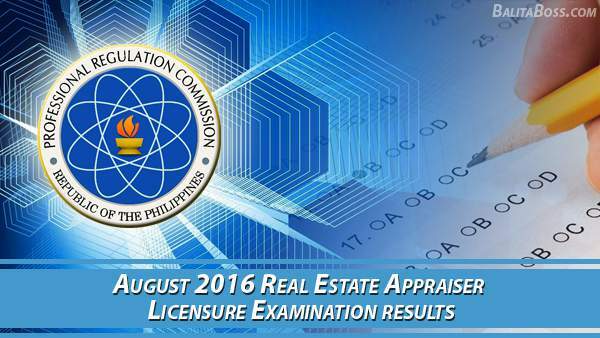 The Professional Regulation Commission (PRC) released the official results of August 2016 Real Estate Appraiser Licensure Examination on Wednesday, August 17, 2016. The examination was conducted by the PRC on August 14, 2016 in the cities of Manila, All Regional Offices; Zamboanga. A total of 20 out of 27 examinees passed the August 2016 Real Estate Appraiser Board Exam, according to PRC (via PRC Website). To download the August 2016 Real Estate Appraiser Performance of Schools, please click here or here. The Board of Real Estate Service who administered the Real Estate Appraiser Board Exam are Dr. Eduardo G. Ong as Chairman, with members namely Florencio C. Diño II and Rafael M. Fajardo. Starting August 26, 2016, registration for the issuance of Professional Identification Card (ID) and Certificate of Registration will be announced later. Please go to www.prc-online.com and follow instructions for initial registration. All registrants are likewise required to submit an original copy of Surety Bond for three ( 3 ) years (with certificate of good standing from the Insurance Commission), minimum amount of which is P 20,000.00, with the Professional Regulation Commission (PRC) as Obligee. For government employees, no Surety Bond is required, but instead, submission of a notarized original Certificate of Employment showing that such appraiser license is an eligibility requirement of his/her employment from their respective offices. The date and venue for the oathtaking ceremony of the new successful examinees in the August 2016 Real Estate Appraiser Board Exam will be announced later, the PRC said. During the examination conducted last April 2016, a total of 1,271 out of 3,794 passed the Real Estate Appraiser Board board exam, PRC announced. Thank you for reading. Please follow Balita Boss on Facebook, on Twitter or on Google+ to receive updated information about the Real Estate Appraiser Licensure Examination.